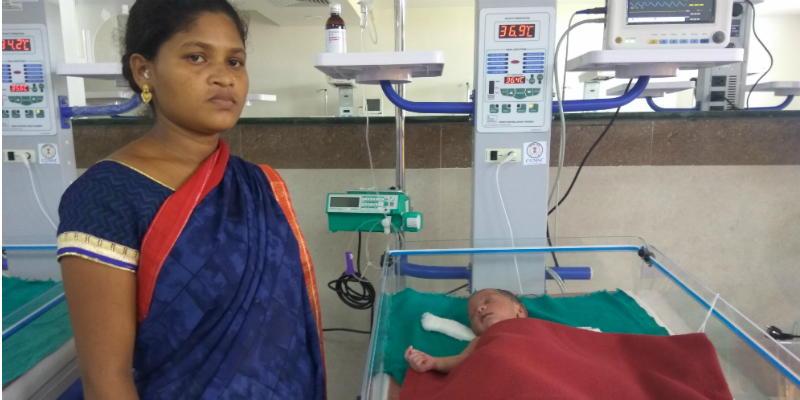 On September 25, 26-year-old Kumeshwari Lendya gave birth to a child in primary health center, located in Balamang village of Balod, but due to complications during delivery the newborn had trouble breathing. The doctors there said that this has happened because the baby has been drinking dirty water in the womb. Kumeshwari's husband Parmeshwar was not able to figure anything out. It was then that the primary center doctors advised them to go to Balod's Mother and Child hospital. Parmeshwar immediately left for Balod, with his wife Kumeshwari and their newborn baby. The child was admitted to Sick Newborn Care Unit as soon as they reached the maternity hospital. The doctors started treating the baby. They reported that drinking dirty water in the womb has resulted in infection in the lungs. The child was in a critical situation. The entire team of doctors got engaged in the treatment of the child. On the other hand, Parmeshwar’s family was diligently praying to God. Parmeshwar and Kumeshwari also have a three-year-old daughter named Khushi. The entire family loves her a lot. One of Parmeshwar’s brothers is in the army and the other one is a teacher. They are a happy family together. When Kushmeshwari got pregnant, the mere news of a second baby coming to their family, made them extremely happy. Therefore, the trouble following the birth of the baby had disturbed everyone. Parmeshwar’s brothers kept calling to ask for the baby’s situation. Even the relatives started calling, but only doctors could treat the baby. They did not have any core work left. They did not leave any stone unturned. Finally, SNCU gave a news that relived them all. The staff came and informed that the child is out of danger. The doctors gave injections to the child and the oxygen was reaching the baby’s brain. The child even started to show some signs of movement. It was a sign the child was completely normal. Then Kumeshwari was taken inside so that the child could get mother's milk. After one or two hours, Parmeshwar himself went inside and saw his son. Then he came out and broke the good news to the whole family. After Parmeshwar's phone call, the family got happy again. They burst crackers and distributed sweets. In this way, the doctors of the Mother and Child Hospital once again helped retain the happiness of a family. This hospital has relieved a lot of other mothers like Kumeshwari. After launching SNCU in the hospital, 125 such cases have been successfully treated upon. This Mother and Child hospital is located beside the Balod District Hospital. SNCU is the specialty of this hundred-bed hospital, where the doctors are capable of treating severe and serious illness. For the villagers, this unit is a boon. Take Parmeshwar for a case. He owns two and a half acres of land, which he cultivates to feed his family and himself. It was a relief for him that the treatment in this hospital was absolutely free. This hospital has both gynecologists as well as child specialists. Doctors of primary health center present in villages around Balod district send pregnant women and newborns to this hospital for their treatment.